Welcome to Gang Apparel Accessories. 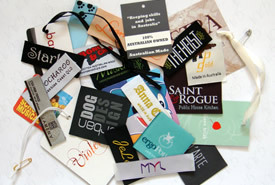 Located in Sydney, Australia, GAA specializes in Woven Labels, Printed Labels, Woven Patches&SwingTags. We guarantee our high standard service, high quality and short turnaround time. At GAA, we supply free samples for you to confirm before production. Our quality designer clothing labels are ideal for anyone wishing to have their own woven clothing labels or printed clothing labels. All our garment labels are custom made. We can weave any sizes from 5mm to 200mm and up to 8 colours. If you just start your business, GAA can help you. We supply small quantities of woven clothing labels, printed clothing labels, woven patches and swing tags for your start. If you are not sure about your labels, our service person will help you create your labels without any charges. We also can do big projects. If you use lots of clothing labels, printed ribbons and swing tags every year, we can make stock for you. So the labels and swing tags can be delivered to you or your manufacturer directly when you place the order. This is the best way you can keep your labels and swing tags consistent and save time.